I am attempting to correctly cite an entry from the 1911 England Census where the data is imaged from the National Archives and the database from which it came is Ancestry.com. In drafting this, I referred to EE item 6.51 (online database entries), various references in EE to layering, and other guidance on this site. 1. "1911 England Census", County: Lincolnshire, Civil Parish: Aylesby and Healing, Enumeration District 48, Registration District: Grimsby, Registration District number: 422, Sub-registration District: Great Grimsby, Street Address: Aylesby, Class RG14; Piece:19999, number of schedule: 133, line 2, Annie Margaret Lowish; type of image - digital image, Ancestry.com, (http://www.ancestry.com: date accessed: January 29, 2019), citing Ancestry.com. 1911 England Census [database on-line]. Provo, UT, USA: Ancestry.com Operations, Inc., 2011. Original data: Census Returns of England and Wales, 1911. Kew, Surrey, England: The National Archives of the UK (TNA), 1911. Data imaged from the National Archives, London, England, page 270 of 285. Lindley Roff, you’re right. The first example has a problem, but the effort to correct it in the second example went awry for a different reason. Let’s take the two notes in reverse order, given that the second is the easiest to deal with. The format that you are using is the format for citing Ancestry’s own database entry—not for citing an image of the original. The two are two entirely different things, of course. Ancestry’s database entry is a derivative record. The data entry clerks who extracted the data into Ancestry’s database may have misread names, dates, or any other data. When we use an image of the original, that’s what we need to cite. Here, your emphasis is on the original, but there are several issues that seriously affect clarity—i.e., someone’s ability to understand exactly what you have used. See EE’s blog post, “Periods. Create. A Full Stop.” Also see EE 2.20 and 2.38. Going back to the very basics of citation that are covered in Chapter 2, several different sources can be cited in a reference note (i.e., footnote or endnote). If we use multiple sources to prove a point, then we cite all those sources in the same note. How, then, can our reader determine where the identification of one source ends and the identification of the next one start? The magic sign is the period. Reference notes are written sentence-style. All details that identify a source go in one sentence. When we get to the end of the details for one source, we close it out with a period—a full stop. Then we start a new sentence for the next source. When we get to the end of the details for the second source, we put a period. Then we start the details for the third source. Etc. Note 1, as constructed, has six periods. That tells your reader that you have cited six sources. Yes, an experienced user of that set of records can sort out the 98-word citation and realize that you are citing just one source. But most users of our work aren’t experienced researchers. That’s why the basic rule exist: A period creates a full stop. It's the end of our citation to that source. You’ll note that EE 2.38 also discusses the difference between reference notes and source-list entries. Source lists (bibliographies) are a totally different form of “writing,” with different needs and different layouts. It's also something that's not used by most hsitory researchers until they complete a book and need to create that end-of-the-book bibliography. Source lists are also alphabetized so items can be easily found. Alphabetization is usually under the surname of the author or, in the case of original documents, under the largest "location." To do that, personal names and jurisdictions are inverted and a whole different set of punctuation rules are used. In source-list entries, periods are used to separate each element of the citation. That works in a source list—i.e., there is no confusion about where details for each source stop and the next begins—because source lists maintain clarity by putting each source in its own "paragraph." Multiple sources are not run in together, as with footnotes and endnotes. Ancestry does not use any standard citation format. While JSTOR, FamilySearch and some archives helpfully offer ready-made citations we can simply copy, Ancestry gives us source descriptions in various ways and usually in multiple paragraphs. Some of its data is presented reference-note style. Some of it is bibliographic style, with many periods separating parts of the description of a single entity. Some of Ancestry’s data is important to identifying the image we’ve used. Some of it is there because it is important to Ancestry’s protection of intellectual property rights for its own database; copying that into our citation creates redundancy and confusion. As users, we have to pick through the details to create a logical citation. Then we cite those details following the standard format for whatever it is we’re citing. For example, in the portion of the citation where we identify the record’s archival location, we present those details in the standard order for citing an archival record. Because reference notes are written sentence style, we follow the basic punctuation rules for writing sentences —including rules for the use of a colon. In a sentence, a colon is a major, major break. As a rule, a colon appears only once in a sentence. Everything that appears after that colon is considered a single unit, a clarification or restatement of what has already been said If I’ve counted correctly, the first layer of your citation has 8 colons. Where a colon would normally create a break in thought, your readers must readjust their mindset at each colon and link the words immediately before and after—then create a mental break where the next comma appears. Each element of the database is on a line by itself. Each element follows the format Item label : specific detail. Again, when we convert an Ancestry database entry to a sentence-style citation, we have to pick the precise words needed and punctuate it the way a citation sentence is punctuated. As you suspected, all of the details that appear in Ancestry’s database entry are not necessary for a citation. As a clue to what is essential to relocate the exact record, look at the “path” that Ancestry describes above the image. It reads: 1911 Census England … Lincolnshire > Aylesby and Healing > 48. In other words: name of census, county, civil parish, and enumeration district. The rest of the details from the database entry (registration district ..., registration district number ..., sub-registration district ..., street address ...) are details that would appear in the research notes where we extract all the details of the census. Details that belong in one layer of the citation should not be mixed into the other. Each layer of the citation deals with a different entity. When we’re citing an imaged record at a site such as Ancestry, we have three layers. Layer 1: We cite the image of the original document. We cite what we see. We don’t cite details that we can’t see for ourselves, to ensure that they are accurate. Layer 2: We cite the website and its database. Layer 3: We cite the basic details that our provider gives us for its source. “Class RG 14, Piece: 19999,” is not information that we see on the image. It’s not information we can verify for ourselves. It’s information our provider tells us—and it may or may not be correct. That data goes in Layer 3, where we cite what the provider says it has used. The phrase “page 270 of 285” appears in your layer 3. However, those are not page numbers for the original document (if so, they would appear in layer 1.) Those are image numbers created by Ancestry. As such, they go in layer 2. 1. 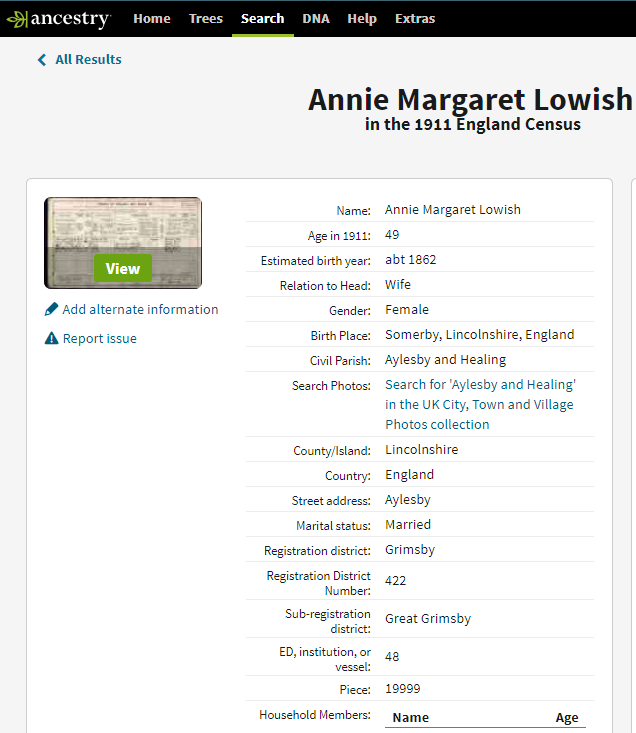 1911 census of England, Lincolnshire, Aylesby and Healing, Enumeration District 48, schedule 133, line 2, Annie Margaret Lowish; imaged, “1911 England Census,” database, Ancestry (http://www.ancestry.com : accessed January 29, 2019), image 270 of 285; citing RG14, piece 19999, 1911 Census Returns of England and Wales, The National Archives of England, Kew. And now, the 98-word citation is reduced to 51. Since I’ve nitpicked so much about punctuation (something I normally try to avoid) and lest our readers come back with a “Yeah, but …” to tell me I've done something "wrong," I should clarify one other point. EE citations follow American English rules for the use of the comma, which places it inside quotation marks. In the re-do of the citation, I’ve left your British English arrangement in which the commas are outside of quote marks. Note that after the URL, EE inserts a space before the colon, so that the cyber-elves that create hotlinks out of URLs will not include the colon in the URL and thereby make the URL not work. Wow. EE, thank you so much. I am rather a nit picker myself so yours informs rather than bothers me. You've given me a lot of information to digest and, rather like trying to eat the proverbial elephant, I will try to do so one bite at a time. I may come back to this a bit later once I've absorbed your thoughts and guidance. Meantime, thank you so much. Hope it helps, Neighbor to the North! EE's punctuation is one of my biggest nit picks. I am "always" trying to get it right - but I do prefer the placement of a comma inside quotation marks (even though I am generally usually/citing non US records). I really enjoyed reading this discussion. RobynRon, commas and periods inside of quotation marks are definitely tidier, but rarely is there a clarity issue—unlike the question mark, whose position inside or outside of quotes has a meaningful difference. EE tends to have a hissy fit over punctuation only when it creates a clarity issue.